Located in Traverse City, Michigan, Louie's Meats is the proud maker of O'Brien Corned Beef. Since 1980, O'Brien Corned Beef has been the choice of restaurants, delicatessens and home kitchens throughout Michigan. Louie's Meats was founded in 1962 by Louie Alpers as a way to custom process meat from local farmers for area residents and businesses. Louie's soon grew to serve restaurants, delis and distributors statewide. In 1980, Louie's began making corned beef marketed under the O'Brien name. Today, we are still a family owned and operated business, known for delivering dependable service and the highest quality products at their peak freshness. All of our products are made with the highest quality USDA inspected choice beef, and we are fully HACCP compliant. In addition to O'Brien Corned Beef, Louie's also offers pastrami, ground beef and hot dogs. Our long list of loyal customers know that when it comes to offering the very best in corned beef, pastrami, ground beef and hot dogs, price isn't everything. We've built our reputation with on-time delivery of the freshest, tastiest products available. Our commitment to dedicated delivery means that your order will be there when you need it, 100% of the time. The extra care we put into our products and service means superior taste and added value — because our commitment to you means more sales! Food safety is a top priority at Louie's. We comply with the latest USDA/HACCP standards, and all of our people are trained in the safe handling of our products within these standards. As a family business, we stake our reputation on fresh, high quality and safe products. Corned beef is typically a brisket that has been cured in a seasoned brine. Sometimes the brine is actually injected into the meat, as is the case with O'Brien Corned Beef. Corned beef has its beginning in the days before refrigeration. The meat was preserved in a brine to prevent bacteria and mold. Even with the introduction of refrigeration, corned beef has remained a beloved cut of meat sliced into sandwiches and chopped into hash. 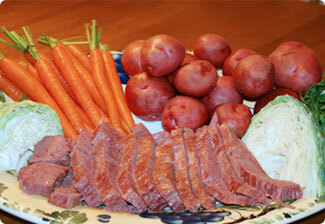 Feasting on corned beef is a St. Patrick's Day tradition in the United States that became popular in the 1800s. Irish immigrants were looking for a substitute for their Irish bacon and learned about corned beef, a cheaper alternative, from their Jewish neighbors. Corned beef is rarely eaten in Ireland and over the decades corned beef and cabbage has become as Americanized as apple pie.